In preparation for this year end post, I took a look at my Ravelry notebook and realized that I’d done a lot more knitting then I thought this year. 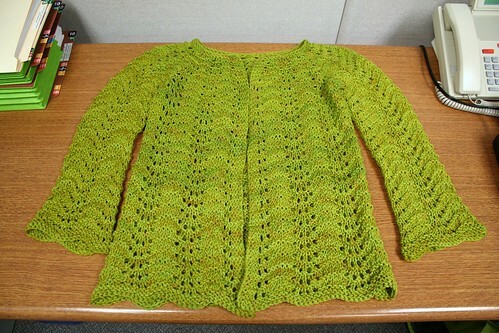 I completed 42 knit or crochet projects this year! You’ll notice one project is missing from this picture. That’s because the recipient of that item hasn’t received it yet and I don’t want to spoil the surprise by posting a picture too soon. I knit more everything then I thought I had this year! 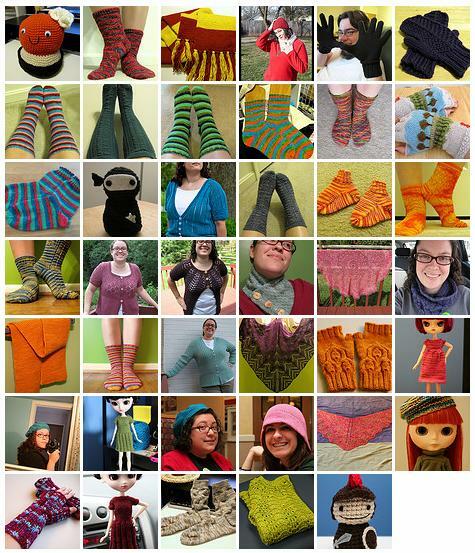 Last year I knit a total of 19 projects, so in comparison, I knit over double the amount I did in 2008 and felt like I knit less in 2009 then I did in 2008. Funny how that works out, isn’t it? As for the one goal I set myself last year about reading 12 books… I didn’t come close. I read 4: Fun Home, Enchantment, The 19th Wife, and Fordlandia. All of them were good, though. I had a hard time getting into a number of books and I don’t think it helped that I didn’t really have a set time for reading aside from lunchtime during the work week. I’m going to try and read more this year by giving myself a set time to read before bed. I won’t set a goal for it, just going to do it and see how it goes. I did, however, do quite well with 365 this year! Today is the last day of it, so it’s not complete yet as I haven’t posted a picture for today, but I’m really pleased that I was able to keep up with it. I learned a lot about taking pictures throughout 2009 and even have a DLSR now, thanks to Matt. Here’s my Flickr set for 2009’s 365. I think I did so-so with knitting goals. I wanted to do more fair isle, but aside from the Rainy Day fingerless gloves, I didn’t do much. I wanted to knit more sweaters and I finished a total of 5, so I’m happy with that. I wanted to try steeking, but didn’t get to it because I ended up not being too thrilled with the colors I picked for the Little Birds cardigan and didn’t get around to ordering new colors until pretty late in the year. I wanted to wear more of my handknit socks and I have. Not too bad overall. I’ve been thinking of this upcoming year and things I want to set goals for. I already know two big ones that are non-knitting related and a few knitting related things that I’m still working on figuring out. I’ll post about those tomorrow. One last FO before the new year! My long sleeved Liesl. Notes: Making the same modifications as the first one. 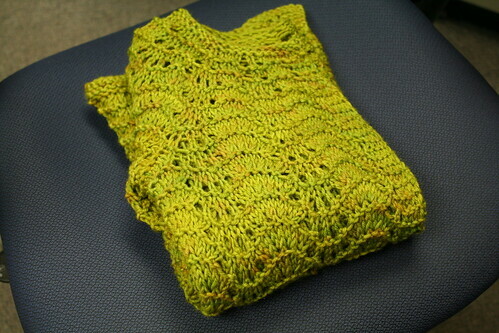 Cast on for the wide neckline. Knit 4 rows of garter stitch then started row 1 of the wide neckline, working the first buttonhole on this row as knit to 4 stitches from the end, k2tog, yo, k2. Tried to go for 3/4 length sleeves, which ended up more like long sleeves, but I’m still happy with how it turned out. I haven’t decided on buttons or a clasp yet. It does have button holes, though. I’m still calling it done since I don’t usually button up sweaters when I wear them anyhow. Last blog post of 2009! Hope everyone had a good year and has a safe New Years Eve celebration. See you all next year!